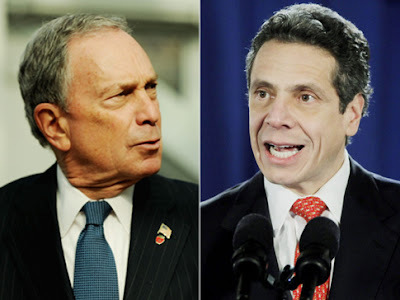 Chaz's School Daze: Mayor Bloomberg's Attack On "Last In, First Out" Is Simply About Power, Money, & Control....And Of Course, Teacher Disrespect. Mayor Bloomberg's Attack On "Last In, First Out" Is Simply About Power, Money, & Control....And Of Course, Teacher Disrespect. Mayor4Life, Michael Bloomberg has started phase two in his attack on New York City's Teachers by using his own money to print out pamphlets and a companion TV commercial touting his accomplishments while attacking teacher seniority-based protections known as "last in' first ouor (LIFO). However, it does appear that Mayor Bloomberg's continued attempts to attack teacher "due process rights" has backfired on the Mayor. A Marist/NY1 poll showed that his popularity rating is at a 8 year low of 40% and most disturbingly for the Mayor the general public disapproves of how he handled the New York City Schools which shows that only 27% believe he is doing a good job as the education Mayor. Furthermore, a majority of New Yorkers with children in the school system (57%) believe his attack on "last in, first out" LIFO was motivated by his desire to control the New York City schools and not about the budget. The majority of New Yorkers see Mayor Bloomberg's attack on LIFO as a simple power grab. Moreover, the Mayor declining popularity ratings and his attack on the Governor and the Assembly has made any changes on LIFO "dead on arrival". In fact in a New York Daily News opinion article today illustrates the Mayor's declining power and influence. Even the New York Post's Michael Goodwin questions if the money is being well spent as he calls his column Bloomy's Tail-"Spin". In Albany, the Daily News reported that Andrew Cuomo quietly met with top union leaders in a peace offering was heard to say the following. And some say he made it clear that Mayor Bloomberg would not be getting his wish to repeal the "last in, first out" law for teacher layoffs. "Collective bargaining is collective bargaining and we have to support those things," one attendee quoted Cuomo as saying. Let Bloomberg foolishly spend his own money but the sooner he accepts defeat on LIFO the sooner he can get down to trying to save the teachers and help the children in the the New York City Schools. Even the majority of the general public now believes that it is not about the budget but about control and teacher disrespect on the Mayor's part. I am still waiting for the union to respond in kind with a commercial that equates Bloomberg's action with the "bad old days" of Tammany Hall and of course the video where Bloomberg says that teacher experience is irrelevant. In reality it is Bloomberg first and "children last" when it comes to the New York City Public Schools. Well said Chaz, I have felt all along that this was a fight he would never win as more than teachers would be effected by a major change to civil service law. I also still believe when it comes to June 1 and principals receive their budgets, layoffs will be avoided and the mayor will tout his managerial skills and those of Cathie Black as the reason that layoffs were avoided. More bluster than the blizzard brought to New Yorkers. Don't give up on Bloomey...he always wins in the end. Watch for layoff notices in last week of April. Yet, this is a man that claimed his business savvy and EXPERIENCE in the financial world would help manage and save NYC. How people voted for this charlatan for a third term is beyond my comprehension.